I suffer from a disposition that I call ‘geographical disorientation’, an affliction which I liken to not ‘knowing’ where something is. It usually strikes when I am trying to remember where I have last parked my car, and most inconveniently when I am in a desperate hurry to go somewhere. I usually can’t remember, a debate ensues, which ultimately results in me having to guess. Living smack bang in the middle of my street, there is roughly a 50/50 chance that I have parked the car either to the left, or to the right of my flat. But it is not unheard of for me to occasionally guess wrong, which means that I invariably have to walk back on myself. Sigh – what to do? The situation wasn’t particularly different when, over coffee the other day, I was trying to tell a foodie friend of mine, D, that the next restaurant on my agenda was the Harwood Arms in Shepherd’s Bush. ‘Oh no, it’s in Fulham’, she said. ‘No, I’m pretty sure it’s in Shepherd’s Bush’, I insisted, and so it went. But now that I have actually been to the Harwood Arms, the consequence of which was that I had to drive to, umm, Fulham, and not Shepherd’s Bush (and this was after finally locating my car), I now have no option but to swallow my words and admit to D that she was correct. Sigh, what to do? For months, I have been hearing all the murmurs from other foodies about how good the Harwood Arms is. One needs to look no further than then the men who are behind this venture to understand why: Brett Graham, chef of the wonderfully delicious one Michelin starred Ledbury; Mike Robinson from Pot Kiln, a gastropub in Berkshire; and Edwin Vaux of Vaux brewery. Stir into the mix head Chef Stephen Williams, whose CV reads of the Ledbury and the big hitting gastropub, Anchor & Hope, and a tantalising concoction was bound to ensue. One of the key features of the food at the Harwood Arms is provenance – meat direct from the wild – and so it’s hardly surprising that game has pride of place on the menu. Take the venison – it’s shot by Mike himself in Berkshire, and he is a man who knows his game, having been shooting and cooking it since his early teens. So game it was to be. As we scrutinised the menu, we ordered a venison scotch egg (£2.50) from the bar menu (not listed on the regular menu) to nibble on while we decided what to have. If the mention of a scotch egg is enough to cause you to grimace with an image of the supermarket versions, think again. The one at Harwood Arms will erase every preconception that you might have ever had about the scotch egg for this was truly sublime. The outer coating was crispy, and the minced venison was moist and tasty. The egg had been gently cooked to yield both a runny yolk, and an egg white, which was firm on the outside, but still slightly runny on the inside. Given its size, extreme time and care must have been taken to achieve such a perfectly cooked scotch egg that was warm though to its core, but which was neither too hot nor overcooked. And at £2.50, it was decidedly good value. Next was our starter of wild rabbit for two (£12.50). This was an ample offering of rabbit cooked in several different ways. 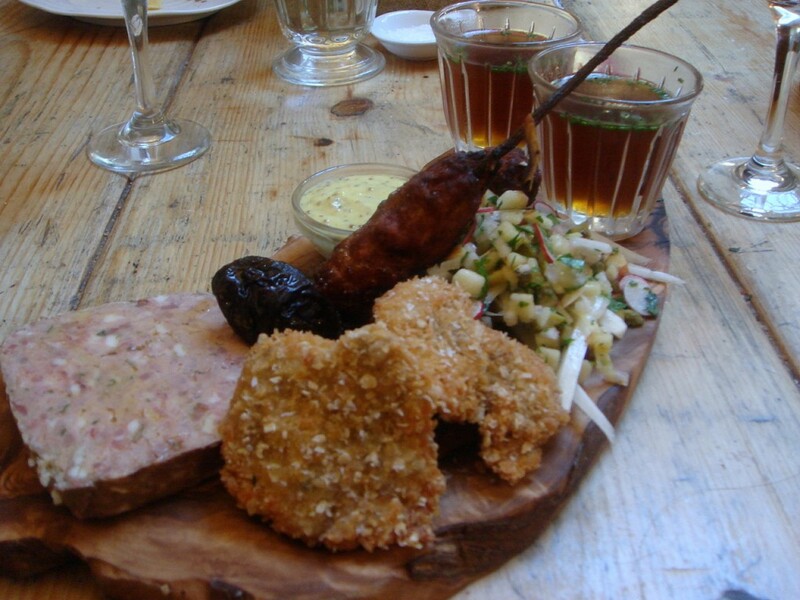 The sharing plate contained two rissoles with majoram and nutmeg, a glazed shoulder, two rabbit schnitzels and a rabbit terrine with liver. All were delicious, although I found the terrine to be a little dry. There were also two rabbit teas – a gamey, clear broth with chives – which with its rich, deep flavour, was excellent. A pleasant salad of dandelion, gherkin, apple, radish and parsley was served as an accompaniment. Giving its pricing, the portion was generous, but my only gripe with it was that there was only one braised rabbit shoulder which made sharing it a little difficult. 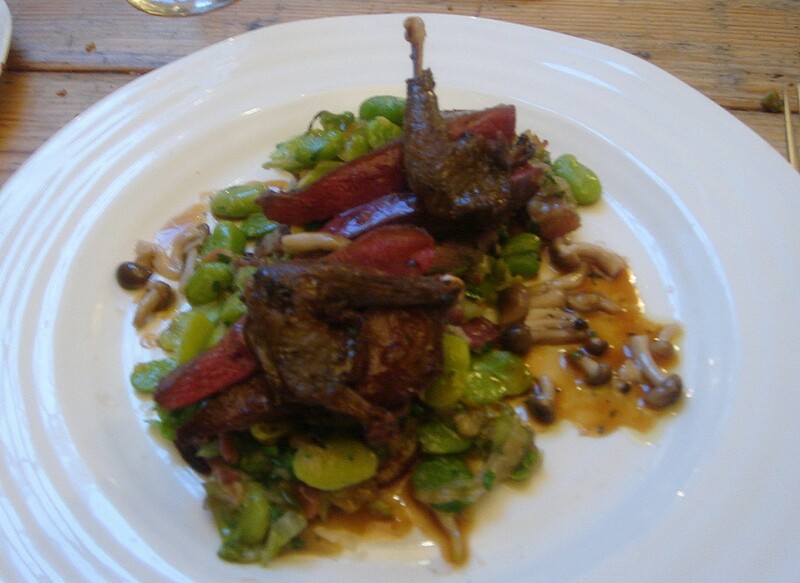 An excellent main of whole Berkshire wood pigeon (£14) was served with Staffordshire oatcakes, smoked bacon, broad beans and soft lettuce. The pigeon, medium rare, was gamey and flavoursome, and with some residual shotgun pellets found in the meat, one was assured that it was sourced from the wild. With the oatcakes smothered in a rustic sauce that contained the bacon and broad beans, the dish became something that was homey and comforting. A Linkenholt Estate Roe deer ‘grilled on bay’ (£15.50) and served medium rare was superb; in fact, it was probably the best deer I’ve ever eaten. Moreover, unlike a lot of deer which taste slightly grainy due to a low fat content, this was tender and moist and full of flavour. It came with grated horseradish, wonderful crispy garlic potatoes, and a salad of baked beetroots, gherkins and watercress, which was pleasant, but unspectacular. As a complete dish, I preferred the pigeon for its wonderful sauce and accompaniments, but the quality of the deer could hardly have been bettered. 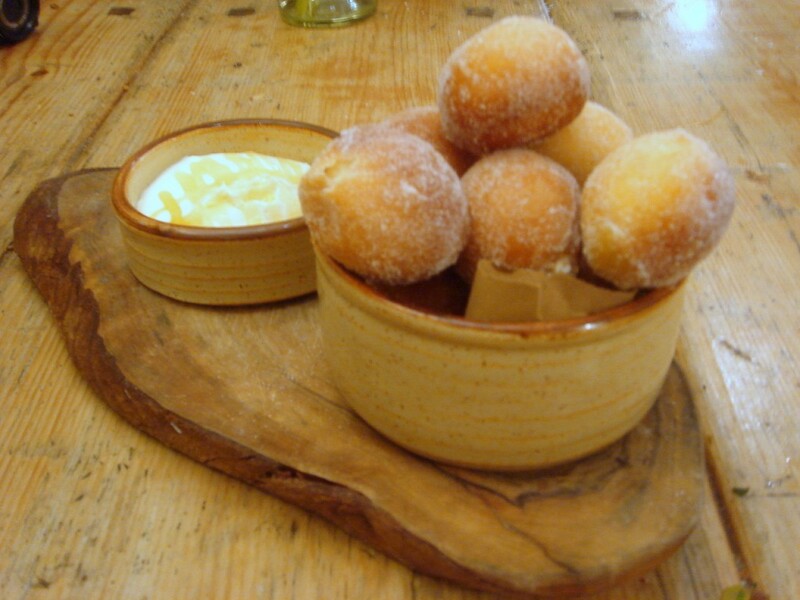 We finished with a bowl of warm lemon curd and sherbet doughnuts with whipped cream and heather honey (£6). This dessert was appetising enough, but of all the things that we ate, this was perhaps the least successful. The doughnuts were a bit too doughy, and with its sherbet filling, was perhaps a little too sweet when eaten with the lemon curd and honey. But this little quibble aside, it’s hard to consider the food at the Harwood Arms as anything but excellent. Quality meat and excellent flavours abound. And what’s more, it was incredible value too. I was pleasantly surprised to find that the pigeon came in at just £14. And £2.50 for that scotch egg? Incredible. As for the starters, (other than the rabbit which was for two), these sit within a reasonable price range of between £6 and £6.75. Price range – £25 to £30 for 3 courses. Excludes drinks and service. 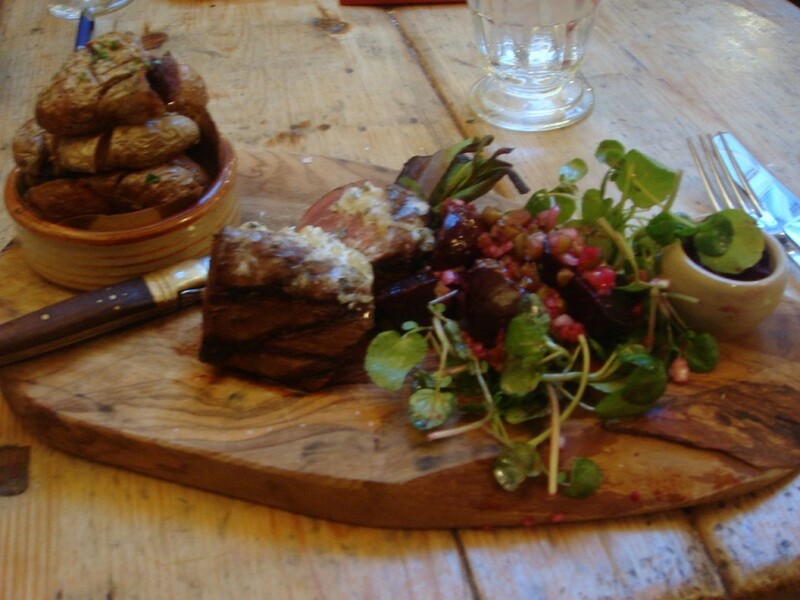 I am noticing a lot of restaurants serving food on boards at the moment (as per your picture!) seems to be a growing trend. Oh that’s really interesting to hear! 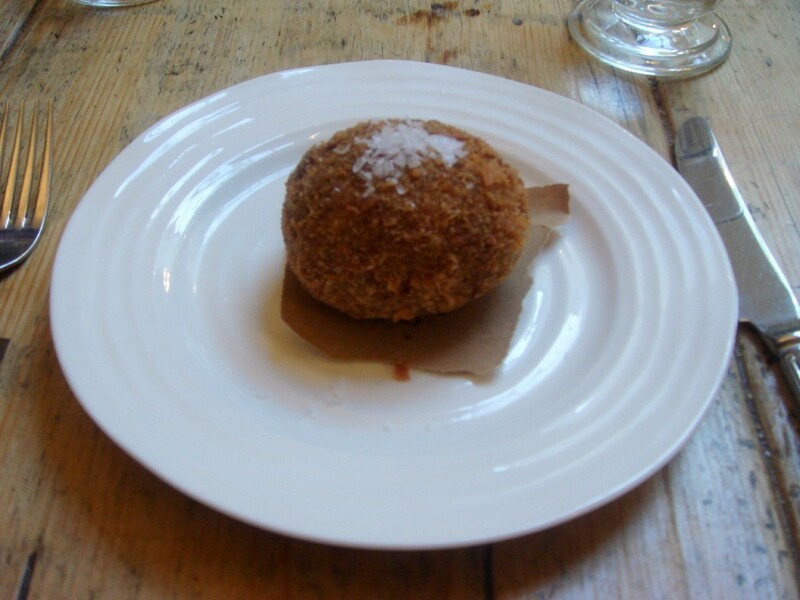 The internet is now flooded with glowing reviews of Harwood arms, especially pictures of the vaunted scotch egg. I’m making a reservation for Friday. This is the great thing about food blogs. The truth comes out! p/s I wouldnt mind going bk to rouss again, ill try their veggie menu for once. The Harwood is very good, have had a couple of enjoyable meals here, but probably not worth crossing town for. More of a “restaurant” feel than a pub, which is a shame. I now really want to go to Harwood Arms. I’ve never had wood pigeon, or Roe deer (although I’ve had other venison), or rabbit. I suppose I’m suspicious of wild game, but now truly want to give a try. Thanks! P.S. I’m also directionally challenged. Hi Gastropub Girl, its a shame you don’t feel its worth crossing town for. I suppose you’re right though – it is more of a restaurant than a gastropub. Hi Monica, do go give it a go! I’m sure you’ll like it. You and Gastropub chick seem to be in agreement that this place isn’t enough of a pub. But I am willing to overlook this as I think the food is so food, especially at what they charge! The venison scotch egg is such a brilliant idea, is going to get me inside the Harwood asap. And it’s really exciting to see a restaurant doing such innovative things with game at affordable prices. Another pub in a slightly obsucre location is the Anglesea Arms – in Hammersmith. Wonderful menu with oysters, smoked eel, all sorts of seafood and really thoughfully put together. Worth a try.